Bursting with an offbeat combination of flavors—salty, sweet, mellow, and tart—this recipe is inspired by a classic Moroccan recipe. This is a wonderful choice for a vegan main dish for a Jewish New Year (Rosh Hashanah) menu. Most of the original ingredients remain in this veganized recipe; the baked tofu stands in for the chicken customarily used in this dish. Don’t be daunted by the ingredient list; it’s an easy dish that comes together quickly and is also a feast for the eyes. Recipe adapted from Vegan Holiday Kitchen. Photos by Susan Voisin. Bursting with an offbeat combination of flavors—salty, sweet, mellow, and tart—this recipe is inspired by a classic Moroccan recipe. To serve, spread the cooked couscous or quinoa on a large serving platter; make a well in the center by pushing the grain off to the perimeter of the platter, then pour the tofu mixture into the center. Sprinkle the almonds and parsley evenly over the top and serve. Find more of VegKitchen’s Jewish New Year recipes. What type of tofu ( firm, extra firm, etc.) 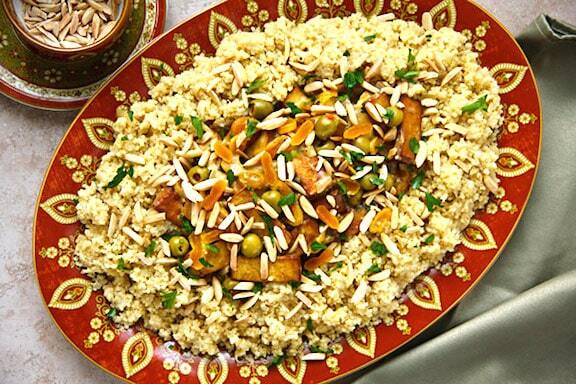 is used in this recipe ( Moroccan flavored tofu with apricots, olives and almonds) ? Audrey, as the recipe states, you want to use baked tofu rather than the type that comes in tubs. Baked tofu is a firmer, flavored variety. You should be able to find it at any natural foods store right near the regular water-packed tofu. I usually use the Soy Boy brand; Tofu Lin or Smoked flavors are good with this. I hope you enjoy it! This recipe looks delicious. I often buy tofu that is wrapped in plastic, as opposed to the kind in tubs. Can I use this kind and bake it myself? I am concerned about the sodium levels in tofu that has been baked by someone else. Thanks so much! Susan, you can surely make your own baked tofu, if you want to do that extra step. Here’s a recipe on this site: http://www.vegkitchen.com/recipes/baked-tofu-teriyaki/ — it’s no slouch in the sodium department, either, but you can reduce the amount of soy sauce, to your taste. Enjoy! I made the recipe and it was delicious. However, I’m looking for a recipe for the holiday next week, and my vegetarian daughter does not care for tofu. Could I substitute chickpeas for the tofu? If not chickpeas, a different vegetarian substitute perhaps? Thank you! I love your recipes! Hi Laura — first of all, thank you for your kind thoughts! 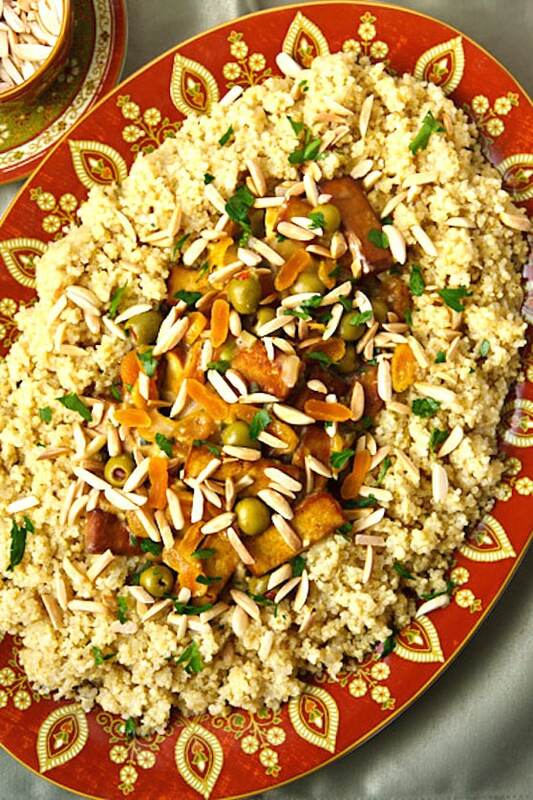 You can surely substitute chickpeas for the tofu in this recipe; or you might consider Seven-Vegetable Couscous, a truly traditional dish for the holiday, that already contains chickpeas: http://www.vegkitchen.com/recipes/seven-vegetable-couscous/ — and of course, you can sub quinoa for the couscous. My recipes are nothing if not adaptable. Happy holiday to you and yours! Thank you! I just want to make sure that the chickpeas don’t “conflict” with olives, for example. Also, what would be the correct amount of (canned)chickpeas to use based on the size of your recipe as it stands now? Happy New Year to you as well! That’s a good point, Laura, but chickpeas and olives are highly compatible, flavor wise. I often combine them in salads. I would say at least the equivalent of 1 can (about 1 1/2 cups, after being drained), though if you’re feeding a larger crowd, 2 cans (3 cups) wouldn’t hurt. You have certainly given me some great ideas for a holiday dinner alternative for the holidays of those who do not eat meat. Thank you so much. You’re very welcome, Ilene. Happy holiday! I’m the vegetarian; the rest are carnivores, so its always a bit challenging to try to make some vegetarian options that will provide me with some protein and that the others will actually eat, too. I made this recipe last night for Rosh Hashana. Chose quinoa instead of couscous, and left out the olives as neither my husband nor I like them. I mixed some of the garlic, cumin, and ginger in with the oil that I fried the tofu in. I believe this helped to make the tofu itself more flavourful. In any event, I thought it was great and so did non-vegetarians. It’ll definitely stay on my Rosh Hashana dinner list for recipes to do again next year (or when we have vegan company any time during the year… c’mon vegan company!). Thank you for sharing it. Shana Tovah! Wow ! what a colorful dish. Is there anyway of knowing where I could get the same serving platter to serive this recipe in? Thanks again !